The January Newsletter has been sent out to all those who have registered on the main band web page to be kept up-to-date. We aim to publish one a month on average. If there is braking, important news - like this years gig list - then we will publish as soon as it is known, alternatively when there is nothing to report then we will not bother you. 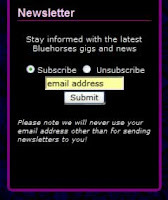 If you did not receive it, and would like to do so in the future, or if you previously signed up but nothing has arrived in your in-box, please enter your mail address in the box (like that to the left) on the main band web page. If your address is already registered the program will let you know, otherwise you will be emailed a confirmation request for the owner of the mail account to accept. Sorry this is an involved process but it helps to stop the spammers, and gives you a chance to change your mind and un-subscribe. You could just keep on checking out the web page every so often, but we think this is more reliable! An alternative (magazine layout) version is also available on the newsletter blog. Both this blog and the newsletter one are enabled for RSS (Really Simple Syndication) - for a detailed explaination then try here at the BBC but basically if you have IE7 or Firefox then just click the funny orange button on the toolbar, and follow the wizard. Even simpler we have put a button to the right of this page to Feedburner.